This street in Auch dates back to the time before the Middle Ages. Tomorrow, July the 14th, is Bastille Day here in France. It is the beginning of what became the French Revolution. One of the consequences of the French Revolution is that upon its completion, the newly formed French government took the land and shut down the monasteries of France. Consequently, many of the places we have visited, places that were once welcoming places for pilgrims on the way to Santiago in the 10th and 11th centuries are, unless they are churches, no longer active religious communities. This is not true for all but for most. The Revolution also affected many churches. We have come to Auch to stay three nights because of the wonderful Gothic cathedral here and because, from here we have easy access to several major pilgrimage stopping places on the way from Le Puy to Compestela. Auch is another one of those cities that has a very ancient history that can be dated into years before the time Christianity came on the scene. After having a guided tour of Auch we left to visit two places. This is one shot of the exterior of the Abbey. One was the Abbaye de Flaran. This former Cisterian Abbey was a place where pilgrims would stop on their way to Santiago. The Cisterians were a reformed group of Benedictines. The Abbey is now run as a non-profit cooperative and tourist attraction. It also houses a fine collection of art. After spending time in this Abbey we went on to the town of Condom. Condom is another important pilgrimage stop and is built around the abbey. Here we not only visited the beautiful cathedral built in the 12th century but also had vespers here sung by the Ely choir. After the service the choir presented a concert. Here is the Ely choir in concert in this marvelous cathedral. We did not have nearly enough time in this cathedral as we had a schedule to make in Auch. It is one of the most unusual Gothic cathedrals I've seen. The iconography in the choir in very impressive. This morning, Sunday, after breakfast we went to Choral Mass at the cathedral here in Auch. Contrary to what you may have heard about church attendance in Europe, everywhere we have been the services have been well attended. That was certainly true today. 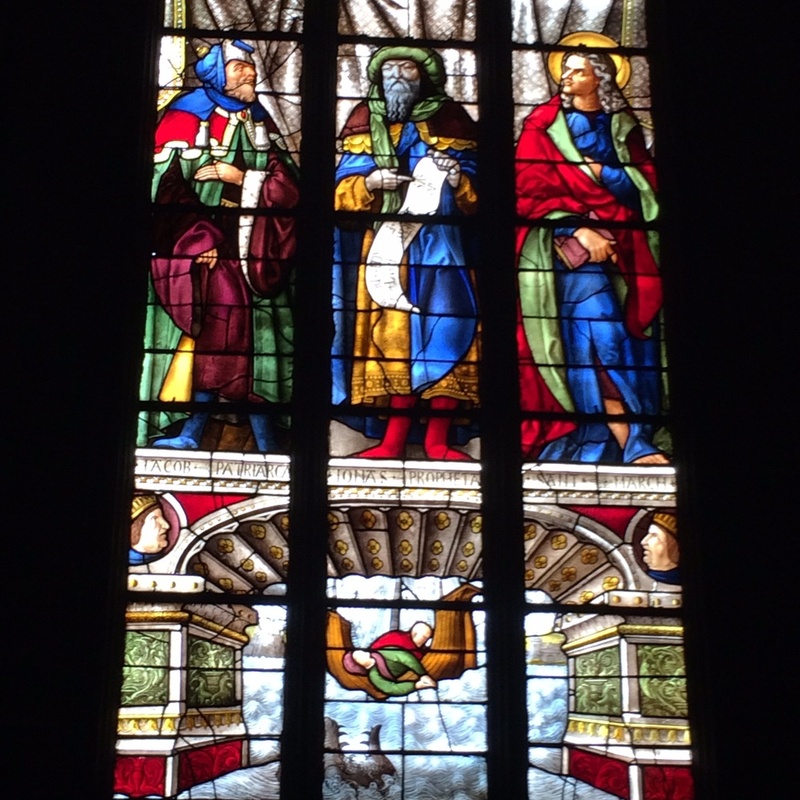 Here is an example of the strained glass in the cathedral in Auch. The "story" in the bottom panel is that of Jonah and the whale. Just like there is no way to take a photograph of the Grand Canyon, there is no way to take a photograph of the cathedral in Auch. This is one attempt to capture the interior of the Auch cathedral. I am grateful for the fact that we have had opportunity to worship at least once a day in these sacred spaces. Of course, as I once heard Wendell Berry say, "All places are sacred. We just desecrate some of them." I am grateful to be exposed to the beautiful art, in the paintings, stained glass and architeture we have seen. Much of this was created during a time before the majority of people could read so the various art objects inside and outside of the cathedrals presented the story to them. I have also been mindful all along this trip of how easy it is for the church, or any institution, to get and abuse power, to never gain an ability for self-critical reflection. Or, to easily lose it. I am mindful of how many people, because of this institutional ignorance and abuse give up on the spiritual journey altogether as well as the religious rituals that undergird the journey toward wholeness. There has been so much to take in on this pilgrimage so far. It is easy for me to focus on being informed about it. Whereas, the real purpose of pilgrimage is not to be informed about it but to be formed by it, to be shaped by the Sacred.